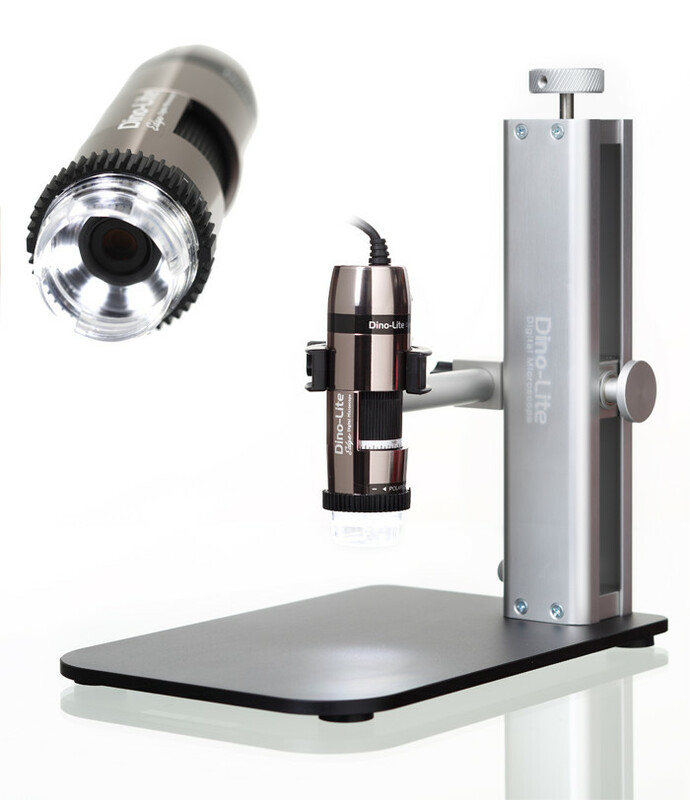 Cellcheck CIL-ZX portable video microscope is the ideal aid for accurate depth measurement. The microscope is fitted with a digital dial gauge which measures the distance between two focal planes for non-contact optical measurement of depths, such as holes in circuit boards, scratches in stress critical parts, or cell depths on anilox rollers and intaglio cylinders. The measurement is accomplished at very high magnification to limit the depth of focus - a possible source of error. For this reason 20x and 30x lenses are included with the measuring system. The 1600 x 1200 pixel USB 2.0 colour camera provides for 900x or 1,230x final magnification on a 24" screen. The virtually play-free, coaxial drive allows precise focusing on the focal plane. To obtain the best readings: Always focus the top and bottom focus level from the same side. This is the only way to ensure elimination of inaccuracies in the measurement resulting from a slight backlash. Here the coaxial illumination directly through the lens plays a significant role. This light guidance is the only method that allows exact recognition of the focal planes. The fine focusing mechanism can be pushed to the side for quick adjustment. An LED ring light is included with the set for materials such as rubber. The nine LED's are arranged at an angle of 30° to the optical centre. The MST Stand provides a secure position on cylinders or flat material for depth measurement. An additional five millimetre X-adjustment is fitted to the stand to enable moving between the focal planes when they are outside the field of view at high magnifications. Cellcheck CIL is supplied with Metric BE software for image viewing and saving in both still and live video. Alternatively, upgrade to KITEC video measurement software which has an extensive range of measurement functions, image capture and annotation capability of in 24 different languages. Combining all this with an easy to use interface and life-time free updates makes Cellcheck an unbeatable package. Measure distances, angles, radii and area, in 24 different languages. Capture images with measurements and create reports in Excel and PDF - Cellcheck makes your work quick and easy. Two Kitec software versions are available, ECO and PRO. It is possible to upgrade at any time from ECO to PRO at the original price difference. Your old version will keep it's value. The software can be installed on as many computers as desired, as it is enabled by the USB camera, allowing the system to be used by a number of employees. Images shown above are of an anilox roller from the field of flexographic printing indicating the type of images obtainable with a 20x lens (approx. 900x magnification on a 17" monitor) First it is necessary to adjust the system above the first focal point. Then focus at the bottom, excluding the remaining backlash. As soon as the upper focal plane is in focus, the dial gauge can be set to zero and the system refocused on the second focal plane (bottom of cell). Then read off the value on the dial gauge or transfer it to the Excel log via an optional data transfer cable and interface. The advantage of using a data cable is that the value on the depth measuring dial gauge is also displayed in the Kitec software. An additional stand with 25 x 25 mm cross table or rotating table is also available. These are very useful when preforming depth measurements on small parts in the laboratory. The field of view is specified in the horizontal direction The magnification factor is based on a 24" screen (measured diagonally). All length dimensions are in mm. The USB 2.0 camera has a resolution of 1600 x 1200 Pixels (1/2" Chip). Divide the visible area in microns by 1600 to determine the pixel size. Box Contains: Cellcheck CIL-ZX-USB, colour USB Camera & driver, coaxial and LED ring light, MST stand with fine focus, Mitutoyo gauge, Objectives: 2x, 4x, 6x, 10x, 20x & 30x. Software CD. Calibration target & certificate. Premium aluminium transport case.